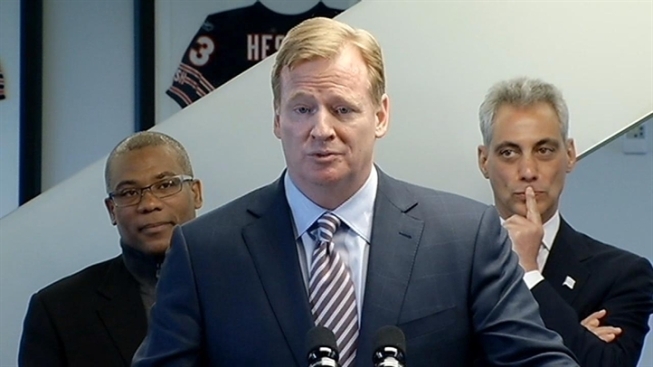 You told NFL commissioner Roger Goodell on Thursday that you'd like Chicago to host a Super Bowl. As the mayor of our fine city, you want to show it off. That makes sense. We have a lovely city, and with the Super Bowl, the world's eyes would be on us for a week. But sir, you do know that it will never, ever happen, right? At first, Chicago seems like a perfect place to host any large sporting event. The downtown area is filled with hotels, ensuring that football fans, players, media and other officials wouldn't have to stay far away from the downtown-area, like they did with Indianapolis. The South Loop, the neighborhood closest to Soldier Field, has recently exploded with bars and restaurants, which are necessary for the many parties that happen Super Bowl week. McCormick Place could easily host the expos that go with the game. The L stops at Roosevelt, meaning game-goers wouldn't need to rely on driving and parking at Soldier Field. But for those who insist on driving, Chicago still has the parking and cabs to help with that. And as NATO and having a president as a native son showed, Chicago has the police and fire departments to easily handle such a large event. What's the problem, you ask? Well, it's Soldier Field. Yes, it was just certified LEED-green, which is very cool. But it is also the smallest in the NFL and doesn't have a dome or retractable roof. Considering Chicago's weather in January and February and the thin skin of visitors, some shelter from the snow and cold we're all used to would be nice. Here's the thing about the fat cats who run the Super Bowl: they like money, and they don't like the cold. They will put up with the cold, like they will when the Super Bowl goes to New York in 2014, when they stand to make a lot of money. MetLife Stadium in New Jersey, where the Jets and Giants play, has 20,000 more seats in than Soldier Field. The average Super Bowl ticket in 2012 was $3,395, meaning that the NFL stands to make $67 million more in New York than they would in Chicago. With that much more money on the line, they'll buy a parka. But Soldier Field doesn't offer that. When the stadium was renovated in 2003, the Bears and the park district took the cheap way out. They modernized just enough to make current fans happy but didn't think big enough to add a roof or seats so that Chicago could be the host to events like the Super Bowl. They made little plans, something that would make Daniel Burnham shudder. So while your enthusiasm is appreciated, Mayor, it is misplaced. Until Soldier Field is drastically updated or completely replaced, Chicago doesn't have what it takes to host the big game.